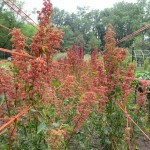 Quinoa is a difficult crop to raise in Northern Indiana because of the frequent summer rains, humidity and warm nights. Ripening seed will begin to sprout in the seed head if kept wet, that is why quinoa is typically grown in arid climates. 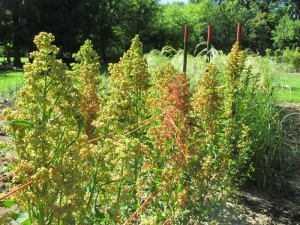 Red Head Quinoa was bred by frank Morton in Oregon. 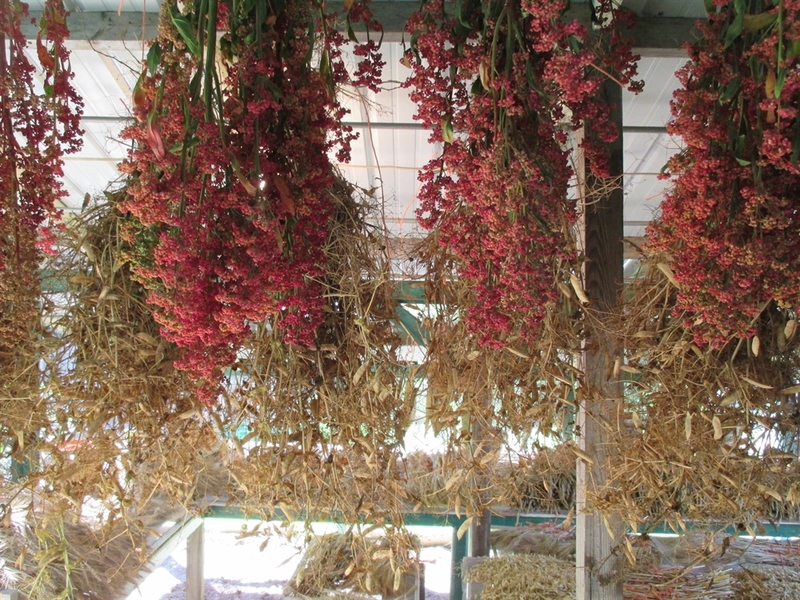 It is able to withstand rain on the mature seedheads and tolerates heat and humidity. The summer of 2014 was one of the wettest I have ever encountered and I was concerned that my first time growing this crop would be a failure. To my surprise, the Red Head variety did well (even with consistently wet feet) and I was rewarded with a fairly decent harvest. Aside from having an adaptable variety for our region I also recommend harvesting the plant early and not waiting for it to begin to dry in the field. 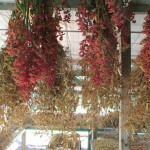 I harvested the whole plants and hung them in my drying shed for a couple of weeks until the plant had dried. Threshing was accomplished by rubbing the seedheads between my hands and then carefully winnowing in front of a fan. I started my plants indoors on April 17th and transplanted into the garden beds on May 20th. I spaced the plants one foot apart. Aside from this variety being able to tolerate rains and humidity, quinoa is also quite drought tolerant. It does prefer a rich soil and benefits from the addition of compost. Quinoa is gluten free and very high in protein. 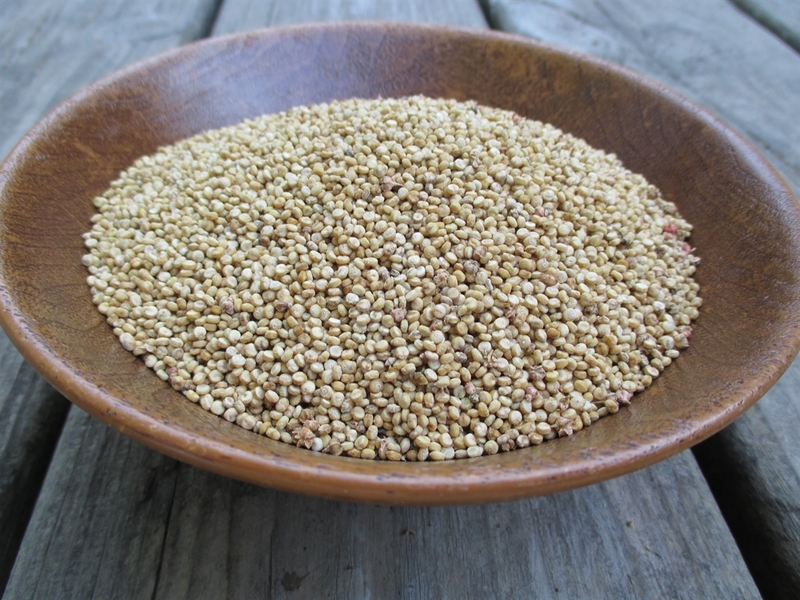 Quinoa seed has a natural soapy coating (saponin) which must be washed off before consuming. 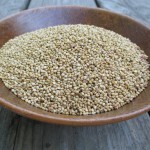 Seed Saving: Quinoa is related to Lambs Quarter. If any of these plants are nearby they could cross-pollinate with Quinoa. When will you have new seed for 2015 for sale? Where did you get your rice dehuller? Do you think I could grow a few plants in the backyard of my south-central Wisconsin home? Or in the basement with grow lights? before setting out into your garden space.